English clergyman, Biblical scholar, and traveler in Palestine; born May 11, 1822, at Eglingham, Northumberland. He was educated at Durham School and Oxford University, and took orders in 1845; but sickness compelled him to live abroad. He explored the northern Sahara, and in 1858 paid his first visit to Palestine. In 1863 and in 1872 he again visited Palestine and spent a great deal of time there in making scientific observations and identifying Scripture localities. In 1873 he made a similar tour into Moab. In 1879 he declined the offer of the Anglican bishopric of Jerusalem, made to him by the Earl of Beaconsfield. In 1881 he journeyed extensively in Palestine, the Lebanon, Mesopotamia, and Armenia. Since 1873 he has been canon residentiary of Durham. 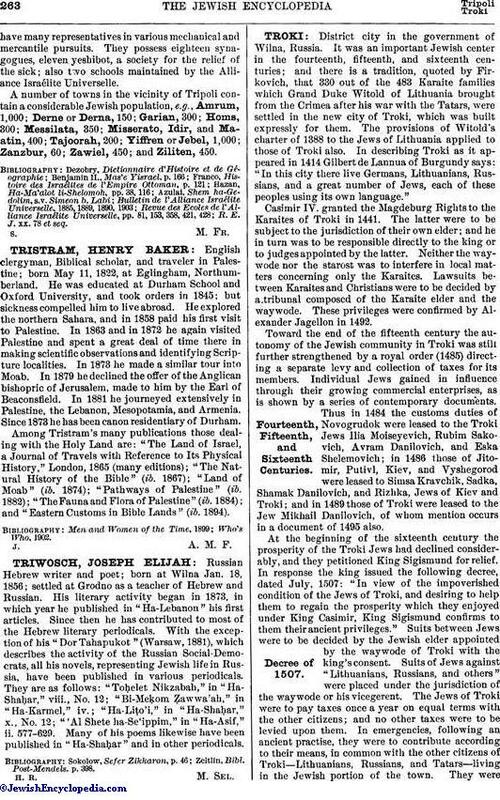 Among Tristram's many publications those dealing with the Holy Land are: "The Land of Israel, a Journal of Travels with Reference to Its Physical History," London, 1865 (many editions); "The Natural History of the Bible" (ib. 1867); "Land of Moab" (ib. 1874); "Pathways of Palestine" (ib. 1882); "The Fauna and Flora of Palestine" (ib. 1884); and "Eastern Customs in Bible Lands" (ib. 1894).